*World Cup Draw: Can the US get a seed? It has been largely assumed that Spurs would have to sell Bale and would not be able to resist an 85 million pound offer from Real Madrid. Daniel Levy is now seen as just holding out to get a better deal from Madrid. But when analyzing Spurs past transfer history and the current dynamics of the market, it becomes clear that Spurs are most likely not bluffing. They want to keep Bale and have no intention of selling Bale this summer for anything less than an absurd 100+ million pounds. And Spurs are exactly right in their approach. Bale is worth more to Spurs in 2013-14 than 85 million pounds. Importantly, this doesn’t mean Bale is worth more than 85 million pounds. Bale is an asset. And just like any property, just because someone offers you a huge amount for your house doesn’t mean it makes sense to sell. Timing matters and the timing doesn’t make sense here. But what about Spurs spending? One reason to think Bale is on his way is that Spurs are spending likely drunken sailors – only Manchester City in the EPL has spent more this season. The logic goes that poor Spurs can’t afford this, so they must already be using the money they plan to get for Bale now. But there are reasons to doubt this. 2011-12 (+36 mil): (Redknapp’s last season), Spurs spent just 6 mill euros (Scott Parker) and sold 42 million euros. 2010-2011 (-23 mil): spent 26 million, and sold just 3 million. 09-10 (-9 mil): spent 40 and sold 31. 05-06 (-14 mil): 36 spent, 22 mil sold. Over the last 8 years (excluding this summer), Spurs have spent an average of 20 million euros more per season than they have sold. But if you don’t count the last two seasons Spurs were spending 30 million euros more per season than selling for the 6 seasons between 2005 and 2011. But the past two seasons Spurs have been a selling club netting 32 million euros. So if Spurs could maintain spending at 30 million per season for the six years prior to 2011-2012 than Tottenham have likely been banking revenue the past two seasons. This means that not only do Spurs have the 32 million euros they have netted the past two seasons, but likely are capable of spending an additional 60 million from a lack of spending. In other words, Spurs have not spent their transfer allotment the past two years. That would equate to Spurs being able to afford to spend about 90 million euros net. Hence, despite already having a net outflow of 47 million euros this window, Spurs should have about an additional 30-40 million euros more they could spend, given the lack of spending the past two years. This is what makes Tottenham’s bid for Willan and others financially viable. Furthermore, if Spurs plan on selling Bale next season, they can count on likely being in the black in terms of spending, likely making them more willing to push their spending limit. Lastly, my guess is that part of the agreement in keeping AVB at Spurs (he turned down Real and PSG) is that he will be given the resources to compete. This current rate of spending is probably part of that deal. So Spurs spending could easily be disconnected from any Bale sale. But still why not sell at 85 million pounds – a Premier League record? First, Spurs will increase their chances at qualifying for Champions League. With Bale Spurs, while not assured, will be favorites for the Champions League. That’s likely an additional 20 to 40 million pounds in revenue. Without Bale, Spurs have a good shot at CL, but the odds get lowered. So lets assume you don’t sell Bale this year and his value drops to 60 million, just because the amount that Real is willing to pay lessens. You still have likely come out even by keeping him and getting into the CL than by selling. Second, it is harder to replace Bale now because you don’t have the attraction of CL. Next year, if Spurs make the CL they can actually use the funds to lure current CL quality players. Right now Spurs have to speculate more in the transfer market, as they have to find players that they think will be of that calibre. Third, you gain global market share by keeping Bale. Bale is the best player in the Premier League and a human highlight reel. 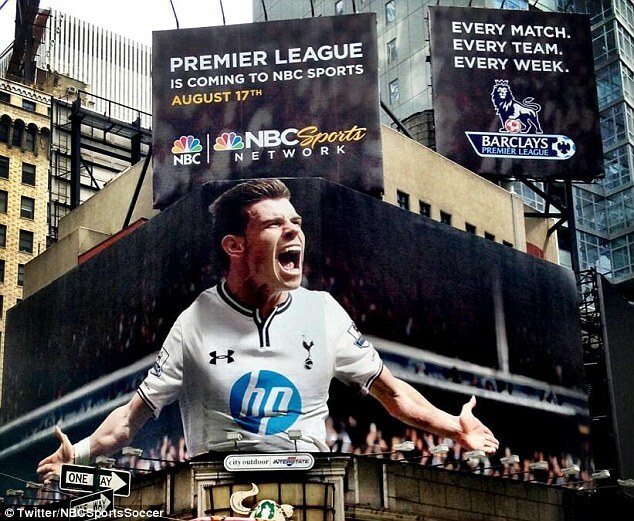 There’s a reason why Spurs ranked top in NBC’s chose your club promotion and its Bale. He’s on the Time’s Square billboard for god sakes. In politics this is called “earned media” – ie free publicity. Spurs will never be able to get this sort of free publicity again. This could hugely impact the potential earnings of the club, as new markets, with a growing fan base have thousands of people looking for a team to cheer for, for jersey’s to buy. Fourth, Spurs actually have a shot at winning the league with Bale. Yes, with Bale (and with AVB and new signings), Spurs can win the title. The top 3 EPL clubs have new managers this season and while Mourinho isn’t exactly “new” he has to reshape the squad and could face a couple hiccups. The winning point totals the past four seasons have been 89, 86, 80, and 86 points. There are reasons to believe that it will be less this year, due to competitive balance and new coaches. Let’s say 82-86 points wins this year. With Bale likely playing as a striker/attacking midfield from the get go and with Soldaldo and other new signings, Spurs will likely improve on the 72 points last year when they had no strikers scoring more than a handful of goals and had a new manager. It is by no means unreasonable to think Spurs could potentially be about 10 points better than they were last year. And at around 82 points they are fully in the title race. A cogently argued and reasoned piece with which I heartily concur. 2011-12 , 2012-13, 2013-14 budget of E30m + E32m underspend = E124m -E47m 2013-14 = E77m +extra TV monies. Finally, a coherently-reasoned article about this year’s seemingly anomalous spending. Thank you. So much more convincing than ‘an in ITK told me Gareth is staying’. I’m still waiting for September 2nd but I now have genuine hope. Nothing but wishful thinking. If Levy really wanted to keep Bale the board would have invested in the team in the last window, where one extra win would have got CL football and given Bale a real reason to stay. Come the 3rd he’ll be a Real player. I think they would’ve been apprehensive about dropping lots of money the second a new manager walked through the door. AVB hadn’t exactly proven himself in the prem with Chelsea and Levy would have been nervous about committing. But let’s face it, he’s done an excellent job in his first season and holding onto Bale would only strengthen our position. January was hardly the second he walked through the door. He’s done a good job. It was Bale who did an excellent job (note the past tense for the latter). TMWNN You must be the glass half empty man I constantly hear about. If Bale is sold for 85m the club that he is then at are liable to gain 25-35m in payments from companies that wish to be use Bale as an associate. Why would Levy, a businessman of high acumen, sell a player that can earn the club that kind of income. That is why the price has been quoted at 105m, he doesn’t see why Spurs should lose out, having helped create brand Bale why then would you give your part of that income to Real Madrid, lets face it, they only took Beckham on for the money he could make them, to them it’s a commercial deal. Some of your comments on HH border on the ridiculous, Bale will only go if there is no loss financially to Tottenham. Why would Levy sell? Er, how about because Bale wants to leave and no longer cares about Spurs. Just carry on kidding on yourself with your glass half full optimism. We’ll see who’s been a totally naive come September 3rd. FANTASTIC COMMENTS IN YOUR REPORTING. To add to the finaces have been the removal of top earners to bring down the wage bill (Bentley, Gallas etc) where no transfer fee was gained. Positive good journalism Max Bergmann. Bale is only human and just turned 24. When the mob comes a -calling, who wouldn’t get his head turned. The Timing is not right this year. There will be opportunities for Bale, next new season, and next season.. The world just loves such a down to earth, clean image pulling footballer. Mr LEVY is aware of Bale’s Macro-worth, will fight toe to toe with any offers or clubs that continue blatantly to harass Bale into submission. Mr Levy will hammer back, with equal force. Spurs has made Bale, who he is NOW. First 2 seasons, was quite disasterous for Bale. Bale started to bloom from 2011 to 2013. Bale will continue to bloom, from strength to strength. ” One day…..I may go ” Fair enough. Also Bale still IS better off, continueing his progress, in the best league in the world, watched by millions = English EPL. Millions are watching EPL and Bale, week in, week out. Bale is in the right league, for now. Spain’s economy is not in a healthy situation, banks are not lending, R. Madrid seems to have some tax complications, RM may be using the Bale-factor to counter the Ronaldo -factorto keep Ronaldo at Madrid. With some of these factors surfacing, Bale will be the main one most affected. Let the clouds CLEAR, BALE. When the skies are clearer, you can think clearer, then you make your move, if you still want to. Spurs has been there for you, management, staffs, Mr Levy, Joe Lewis to AVB, and your FANS WORLD-WIDE. GIVE US YOUR GRIN and your ‘Love’ trademark THIS SEASON. The most watched league in the world is the champions league. Guess who isn’t in it. Great article. I think personally that we are building a squad for regular Champions League participation in order to fill our shiny new stadium in 2 years time (allegedly). it would probably be a bigger gamble financially for Levy not to strengthen the side now. In addition we need to sell naming rights etc.. for new ground and this will be a whole lot easier with regular champs league football at the Lane. An excellent article that agrees with my views, a commercial goldmine, which is what Real Madrid have to pay for if they want him. TMWNN on tour. What joy. Bale billboard in NYC was taken down weeks ago.